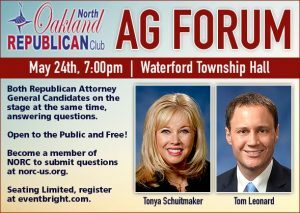 The two candidates; State Senator Tonya Schuitmaker and Speaker of the House, Tom Leonard, will be together on stage at the same time, answering questions and responding to each other. This following a blistering attack mail campaign to precinct delegates by Senator Schuitmaker on Speaker Leonard’s character. Tickets for this public event, held at the Waterford Twp. Hall, on May 24th at 7:00 pm are available on Eventbrite at www.eventbrite.com. The North Oakland Republican Club (NORC) is the original Republican club of Oakland County. Dating back to the 1960s, NORC has provided a forum to meet elected officials and information on current governmental. issues. NORC has also been a conduit for people to get involved in government and an incubator for candidates. NORC provides a community service with monthly free and open meetings featuring top speakers on current topics.